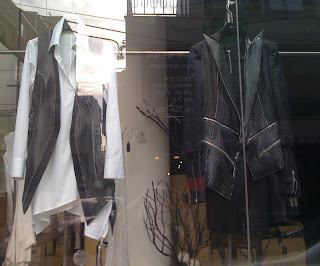 Walking through the ritzy 'Rodeo Street' of Seoul's Apgujeong district I discovered an antidote to the overwhelming sea of khaki, white, blue, or pink worn by a majority of the city's inhabitants. 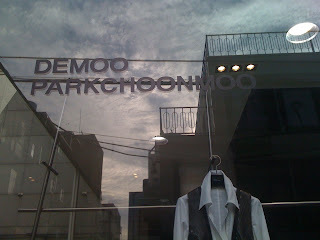 Park Choon Moo, president of the upscale designer's collective NWS (New Wave in Seoul), takes cues straight from the deconstructed depths of Comme des Garcons with the gutteral snarl of early Vivienne Westwood. As this shop only seemed to be an atelier, I didn't get a chance to try on any outfits whilst pretending I could afford them. Check out more from her Autumn/Winter collection from Seoul's 2008 Fashion week here. I saw that shop 2 weeks ago around the same time you did and just did a google! I got so excited - I am absolutely in love with the outfits... but I imagine they must cost a fortune! i know! i'll just have to wait until it ends up at Century 21 or something. ha. thanks for the great link!